Breakfast has always been my favorite meal of the day. It sets the tone and establishes the comforting idea that I have eaten today. Even if I can’t eat for the rest of the day– I forget to pack a lunch, I get caught up doing something and can’t find time, I end up stranded in a desert somewhere– it’s okay because I had a nice, hearty breakfast. This is the reason why as much as I love Italy, I seriously don’t understand how Italians forgo breakfast. Cookies, pastries and coffee are delicious, but it just doesn’t cut it for me as a start to my day. When we were in Sicily this last December, Paolo (the husband of my 5th cousin, Francesca) shook his head as I described how we typically eat eggs for breakfast in America. 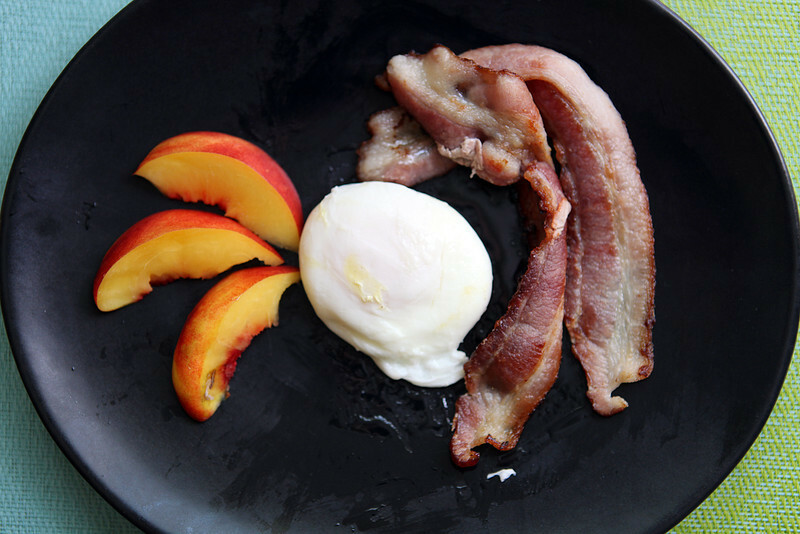 He would frown and say pesante (heavy), cautioning us that eating eggs at the start of the day would make us fat. Cookies however, are totally cool. The real tragedy is that for the first couple days during our stay they did give us eggs in an effort to make us feel at home, and they were the BEST eggs I’ve ever eaten: fresh from a nearby farm, deep-colored yolks, cooked in butter and served with the most delicious bread. So good. But after seeing them look on in horror, we finally decided we would do as the Sicilians do and nibble on our biscotti and sip our cafe in the morning, and then proceed to eat our weight in pasta at lunch. Although I was sad to leave Sicily, I definitely longed for my California breakfast. 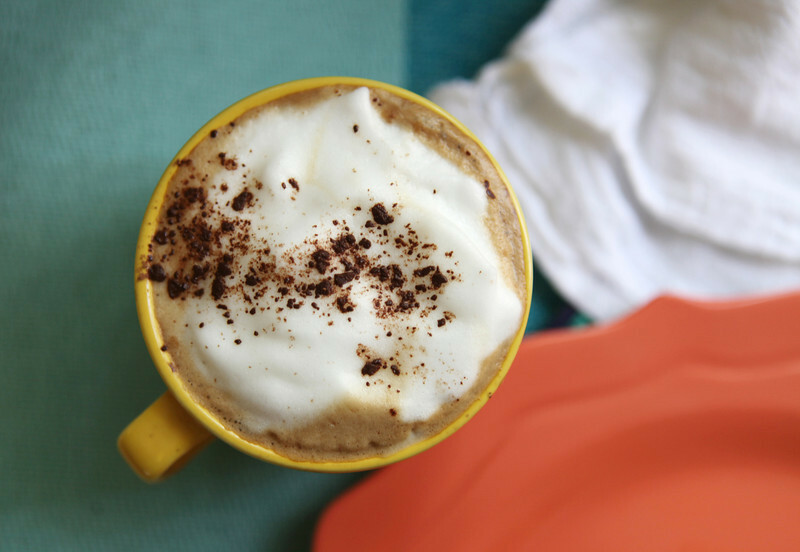 Normally in the morning I take a cappuccino and an egg in some form (I love soft boiled and poached eggs) paired with one or two of the following: a piece of toast, a good-quality frozen (or fresh) waffle, juice, oatmeal, yogurt, fruit, bacon, a sourdough muffin, a pancake or a smoothie. This combination of fruit + protein + carb will lead to a happy Danielle. The only thing I will NOT eat for breakfast is cereal. I just don’t do cereal. The bottom line is, I won’t waste my time with unfulfilling, processed bits of flakes, whether they are sugar-coated flakes or cardboard flakes. Cereal is a soulless food and a horrible way to begin a day, in my humble opinion. 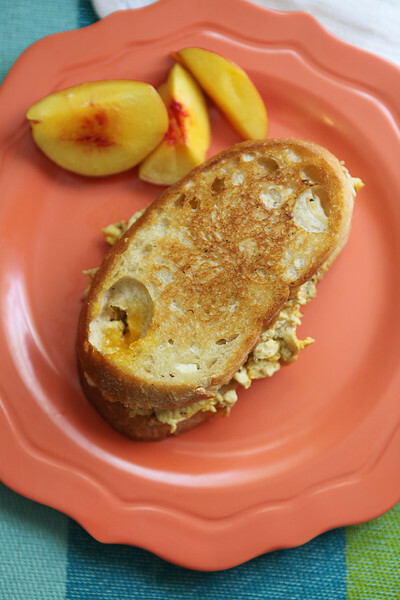 Today is the boyfriend’s day off, so I offered to make him my “famous” egg sandwich. Now, let me say that the boyfriend and I do not eat these regularly and neither should you if you want to avoid heart attacks and gallstones. 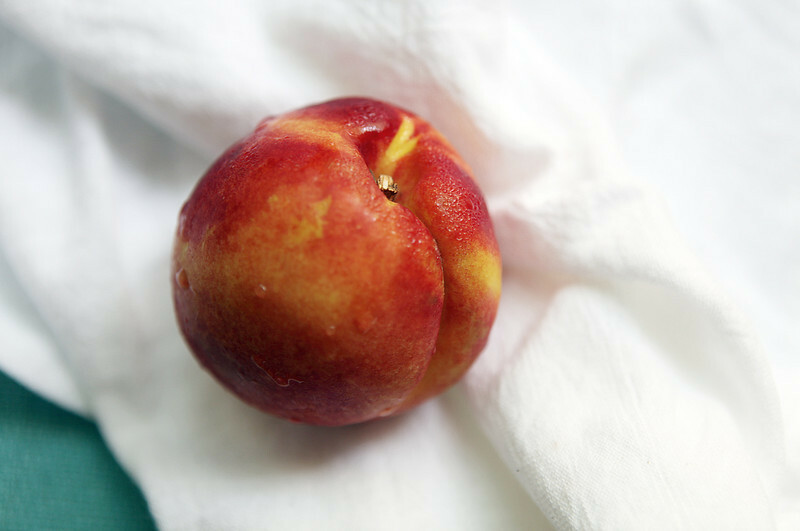 Nevertheless, these make a great treat for the occasional brunch. 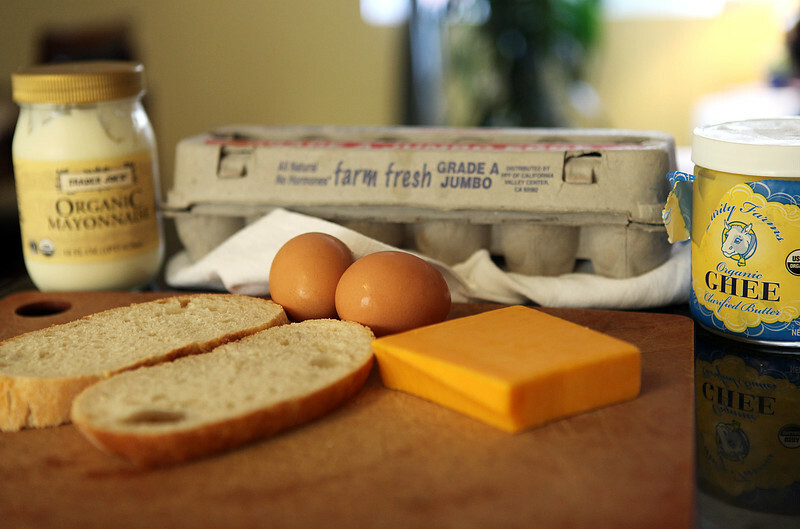 Ingredients (for one sandwich… double or triple it if you intend to make more than one). Crack eggs into a small bowl and whisk with a fork until well-blended. Add buttermilk, salt & pepper to taste. Heat up a skillet on medium. Put 1-2 teaspoons of butter in the pan and then add the egg mixture, continuing to scramble with spatula or fork. If the pan is well-heated, they should cook for literally 20 seconds. My secret to great scrambled eggs is to remove them from heat while they are still a little runny because they continue to cook. Nothing is worse that overcooked eggs. 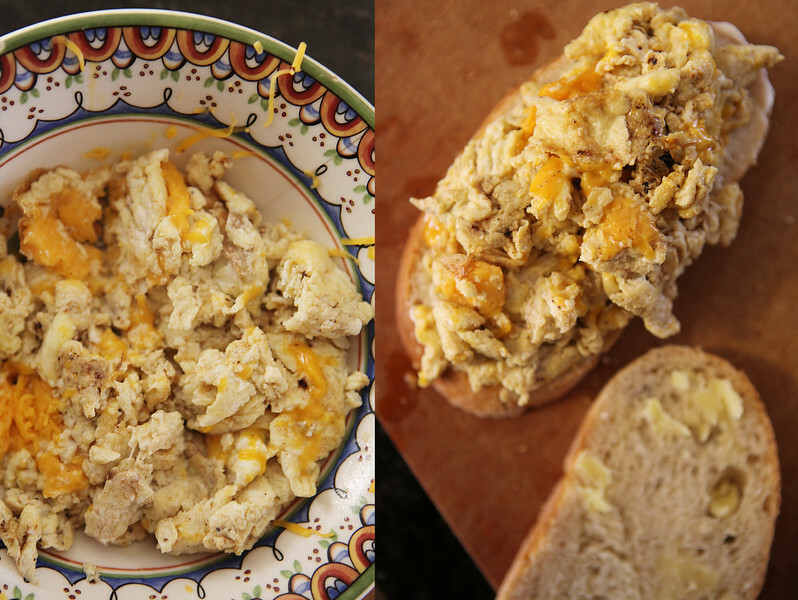 Toss grated cheese into the eggs & allow the heat to melt the cheese. Meanwhile, take the two slices of bread and spread butter on one piece and mayo on the other. 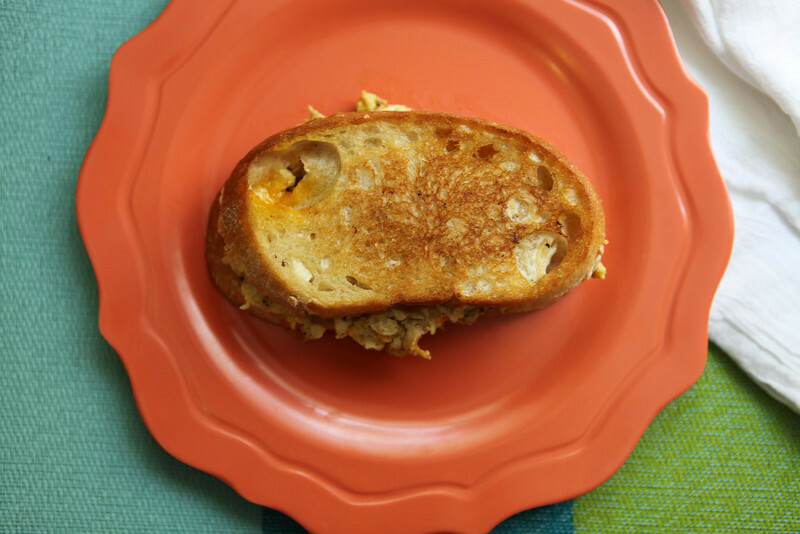 Take the eggs with melted cheese and carefully stack on one slice of bread, and cover with the other. 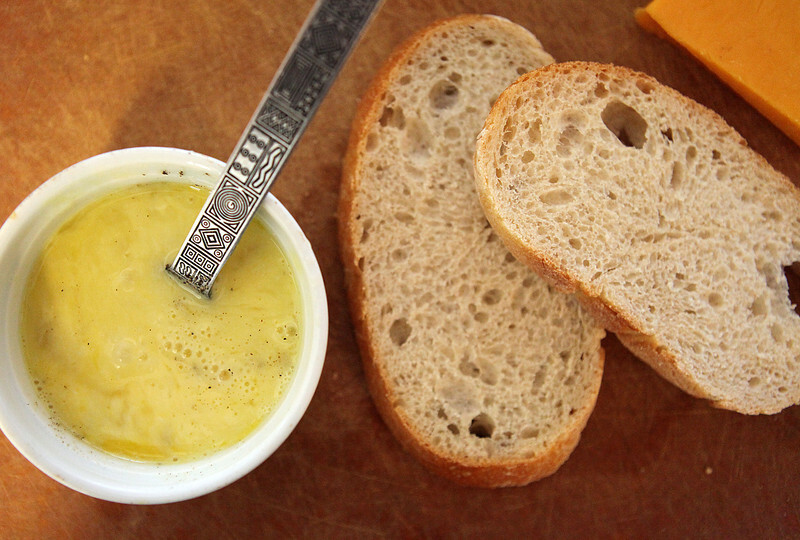 Then spread mayo on the outside of the bread– this is my “secret” for amazing grilled sandwiches. 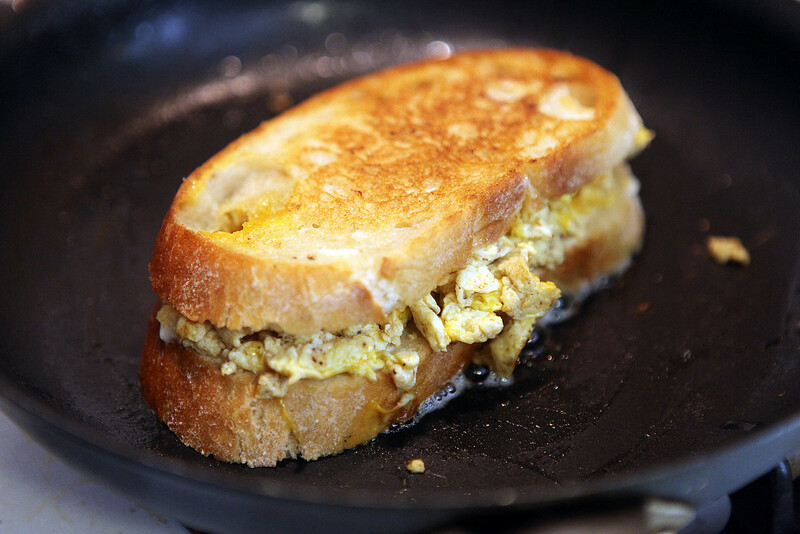 Let the pan re-heat to medium-low, and place the sandwich on the skillet, heating up and getting perfectly crispy and hot. Flip and repeat. Want to make this even worse for you (read: more amazing)? Cook a couple pieces of bacon and then cook the scrambled eggs in the bacon drippings instead of butter and add bacon to it. This is what I did in these photos, which is why the eggs look kind of “off.” I found this version AMAZING, but Dhiren prefers his egg sandwiches straight-up sans bacon flavor (which makes sense since he is a recently converted vegetarian and doesn’t know any better).